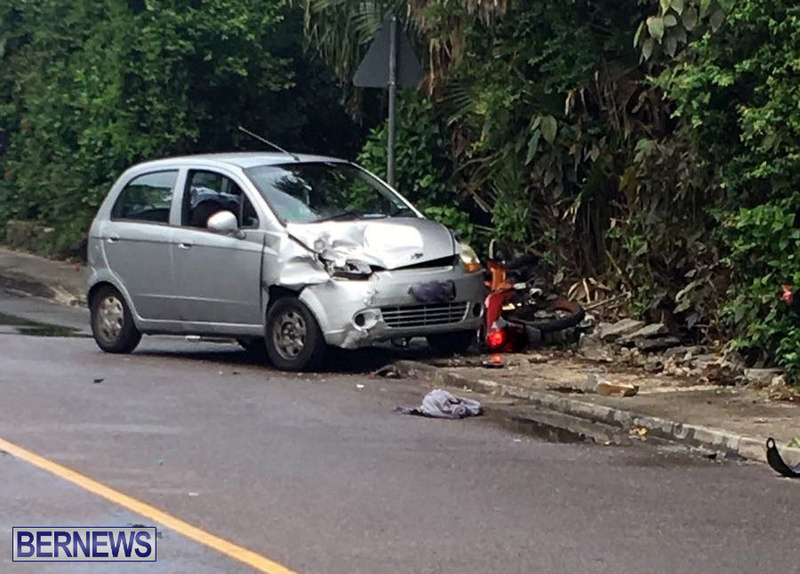 [Updated] There was a collision involving a car and motorcycle in the area of South Road and Elbow Beach this morning [July 1] police have confirmed, with the area cordoned off and traffic being diverted as of 10.30am. Further details are limited at this time, however we will update as able. Update 11.08am: Police Media Manager Dwayne Caines said, “A few minutes after 10:00am, police and first responders attended a report of a road traffic collision that took place on South Road in Paget, 10 meters east of the Elbow Beach entrance. “It appears that a car was traveling west and a motorcycle with a female rider and a pillion passenger was traveling in an easterly direction when it appears that the rider of the cycle collided with the car. “As a result, the rider and her passenger were taken to the hospital with the rider suffering serious leg and foot injuries and the pillion passenger appears to have non-life-threatening injuries. I would like to urge everyone reading this to take their time on the roads. Don’t be in such a hurry to meet your maker as we will all meet him one day. Think about your loved ones who will mourn your loss – your young kids who need you and you will NOT‎ see grow up, your parents, friends, coworkers and neighbours. Is it really worth it to overtake that vehicle when you can CLEARLY see another vehicle coming. Think about that innocent person who is now scarred emotionally by your body slamming against their vehicle. Or even worse – Think about if you take someone else through YOUR recklessness and you survive. Think about the EMTs who now need to scrape YOUR body off the road and the doctors and nurses who will try their best to revive YOU. Think about the ‎person who has to now call YOUR family member and tell them the sad news. So now THINK is it really, really worth it?! I just can’t comprehend the things I see drivers (mostly bikers) doing on the roads. I just don’t understand why they are playing Russian Roulette with their lives. It’s sad to see all the carelessness. And to everyone out there, please use your turn signals, it is nothing but selfish to not do so. It is literally a little click up or down. I’m going to keep saying it too! J.B. it takes years to become a competent driver! All it takes is for the pillion pasenger to turn their head or lean the wrong way to throw the bike out of balance . Pillion passenger should look in the same direction as the driver to keep the bike stable. Squirming around on the rear seat or leaninh the opposite way can also cause the bike to become unstable. The driver should look in the same direction as their intended path. That is to say while riding / driving ” WHERE YOU LOOK YOU WILL GO”. That also applies to car drivers. There is more to safe riding, there is always more, EG: increasing tire pressure when towing, a flat rear tire with the aditional weight can cause stability problems. Riding a bike is not a Circus act. I know my stuf dont you think ? I have only been riding bikes for 65 years ! Alow me to make this comment The Bermuda road conditions are not good. How about waiting 30 minutes for the car to dry off the road after it rains, that works ! May be the problem out there has some to do with self estem or personal insecurities tainted with anger.